After enjoying these days of caloric ecstasy and extravagances, it’s hard to immediately switch to the light and healthier road. It feels like you are giving a kid a candy and 5 minutes later you change that to a cucumber… it is just plain hard. All my taste buds are still in frantic mode and my serotonin levels are a roll a coaster. But Nature is wise, and perhaps knows these facts by sprouting a great Winter abundance of greens, root vegetables, cabbages and cauliflowers among other vegetables. These are my saviors for this caloric transitional period. I need soup to warm me up and fill up my belly with out the extra filling out of my pants.. ahem. Last weekend at my farmers market I ran into these beauties, a warm yellow and a purple cauliflower, rainbow carrots, sweet potatoes and fresh dill. How can you not be inspired when you see all this colors? Soup it is, I was craving the creamy textures and luxurious caloric meals, but with no guilt. So I decided to make an all vegetable chowder using all these winter bounty. 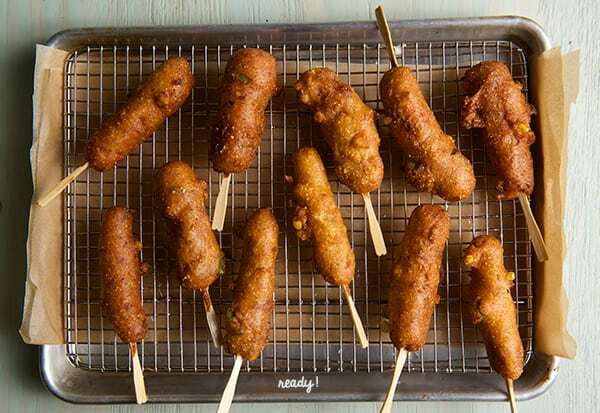 Cauliflower has a delicate flavor. When it is cooked and pureed it resembles potatoes. You would be surprised how close you can prepare it to mimic the potato. I’m sure you’ve heard of cauliflower mashed, cauliflower rice or cauliflower mac & cheese in which this humble Brassica acts like a carb-chameleon. 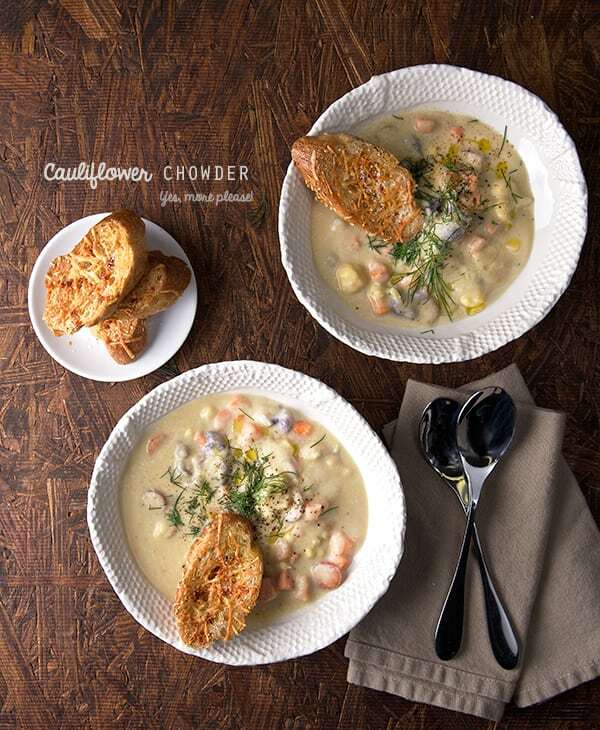 With this premise I started my vegetable chowder by cooking and pureeing part of the cauliflower as the soup base to give that rich starchy like consistency that characterizes a chowder. I reserved some of the cauliflower into little florets which are added latter to the soup to add texture and enhance the cauliflower flavor. 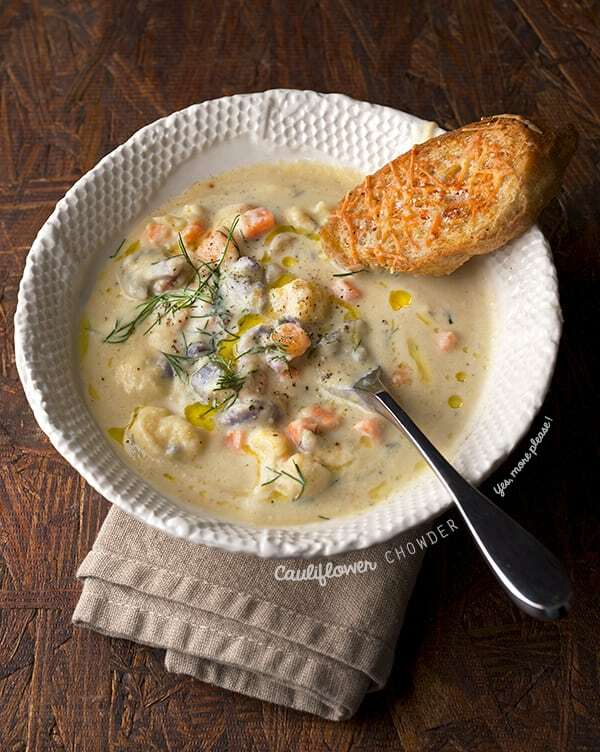 The extra creamy chowderiness comes from unsweetened coconut milk which gives this soup the luxurious velvety chowder texture and it adds lots of good healthy fats that are well needed at this point of the healthy road transition. Do not fear about the coconut over taking the flavor on the soup, you barely can tell is here. 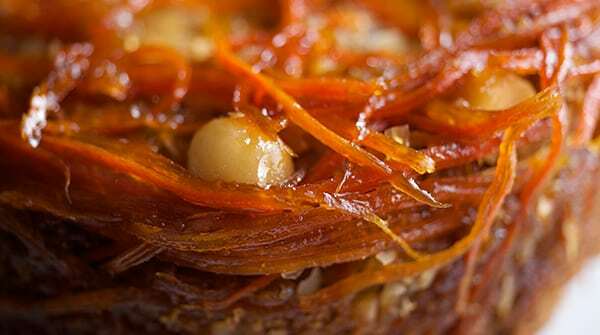 Carrots, sweet potatoes and onions add sweetness, texture and light flavor. Fresh dill adds a great herbal aroma to the soup and complements the cauliflower flavor in a very delicate way. I recommend organically grown vegetables if possible. I know that’s not easy, but increasingly supermarkets are adding those options if you don’t have access to a farmer’s market. In my opinion the flavor is better and I think with a lightly seasoned dish like this one, those flavors are going to shine through. 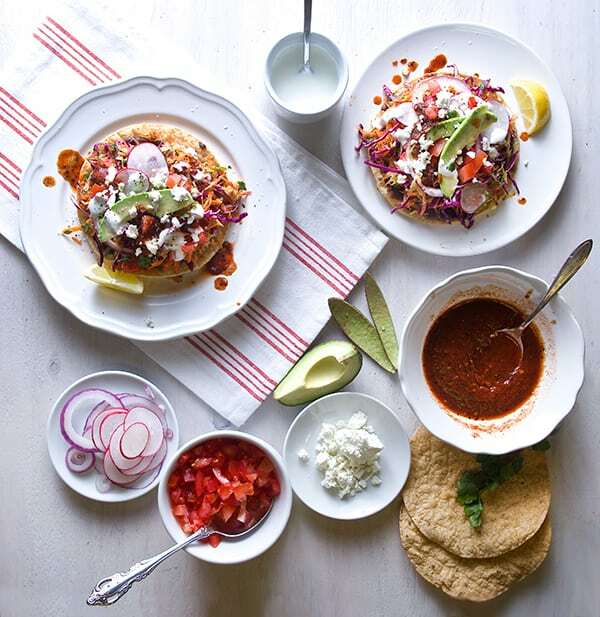 Grilled Cauliflower with Garlic and Cumin rub or My favorite Cauliflower Ceviche …check them out! If you want to know more about the wonderful benefits of Cauliflower, please check out this unique and complete article, written by Helen Nichols, 28 Science-Backed Health Benefits of Cauliflower Enjoy! Serves 4 or 2 hungry Vegans. 2 small or 1 medium Cauliflower heads. 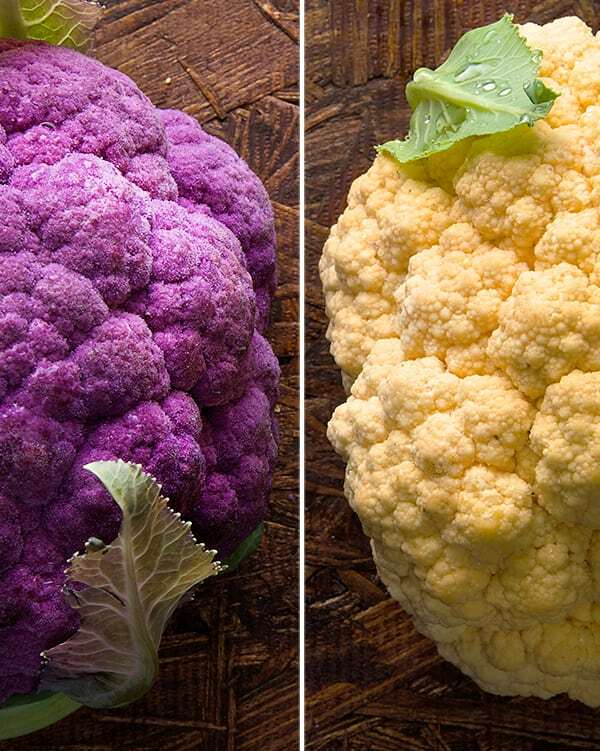 Any color is great about 6-7 cups of small cauliflower florets total, use organic if possible they have the best flavor. 6-7 small carrots, diced or sliced into rounds. I used red, yellow, and orange, use what ever is freshest available at your market. 1 medium sweet potato peeled and diced. 1 sprig fresh dill, or 1/4 to 1/2 teaspoon if using dry and upon your taste. Fresh dill/not fan of dill?… Basil, Thyme, Chives, Tarragon are great substitutions. *I used water instead of vegetable stock, because I wanted the cauliflower flavor to come through. The first time I made this soup I used vegetable stock and I felt it masked the cauliflower flavor to much. Feel free to use whatever you prefer. ** Recently I made this soup adding 2 sundry tomatoes. 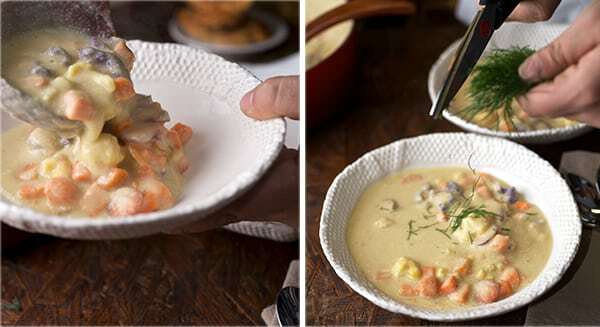 It was a delicious variation, it gave the chowder a slight tint of color and deep of flavor.If using sundry tomatoes add them on step four so they can soften up before pureeing the chowder. 1. Chop and diced your vegetables. With a small paring knife cut the cauliflower into small florets. Reserve about 2 cups of the little florets to add to the soup at last. For this soup I used the yellow cauliflower for the soup base and the purple florets to add whole to the soup, it adds eye appeal. 2. In a small pot, bring 4 cups of salted water to a boil. 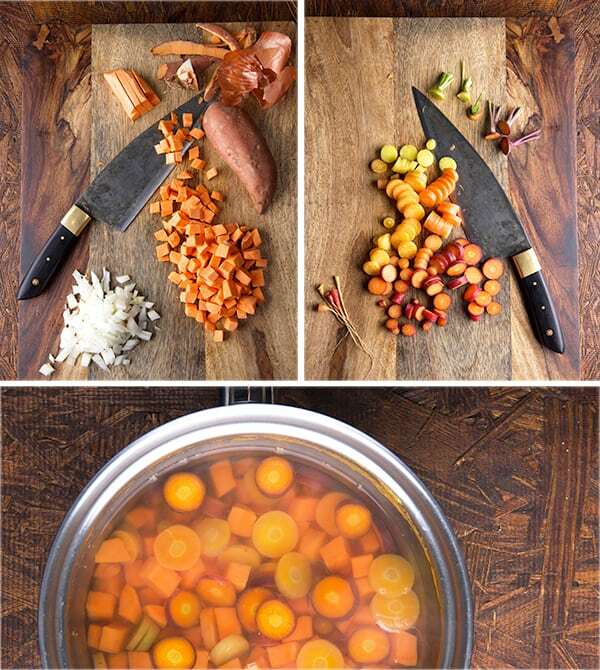 Pre-cook the diced carrots and sweet potatoes for 4-5 minutes, until al-dente, rinse with cold water. Set aside. 3. Over medium-low heat in a medium size pot, add the extra virgin olive oil, and sauté the chopped onions and garlic until translucent, season with salt and pepper. 4. Once the onions are translucent, add ¾ of the cauliflower florets. Toss and add 2 cups of vegetable stock or just enough to cover the florets. Add bay leaf, thyme, fresh sprig of dill/or dry, salt, and pepper, cover with a lid and let them cook for 7-8 minutes or until very soft and tender. 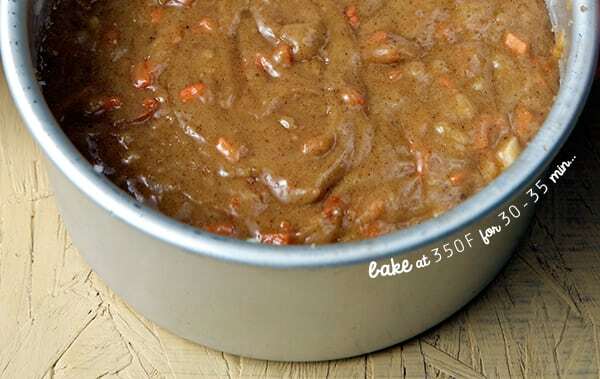 Once cooked, purée them in a food processor, blender, or use an immersion blender until smooth. 5. Place this cauliflower purée back into the pot, add the coconut milk and stir well until blended. Season with celery salt, salt, paprika and black pepper. Add a bit more vegetable stock if the consistency is too thick. 6. Add the reserved mini cauliflower florets, and the pre-cooked carrots and sweet potatoes. Cover with a lid and bring to a slow simmer cook for 5 minutes. Taste and adjust the salt and pepper if necessary. Check for doneness on the vegetables; I like my vegetables on the al-dente side, not hard but not mushy. Taste them and decide if you like them softer keep cooking them for another 2-3 minutes. 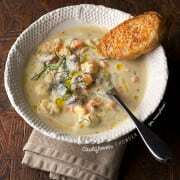 Serve immediately into warm bowls, sprinkle fresh dill, a little drizzle of olive oil, salt, and fresh cracked pepper. One or two whole wheat crostinis won’t hurt right?… Enjoy! 2 small Cauliflower heads, Any color is great about 6-7 cups of small cauliflower florets total, use organic if possible they have the best flavor. 1 medium Sweet potato, peeled and diced. 1. Chop and diced your vegetables. 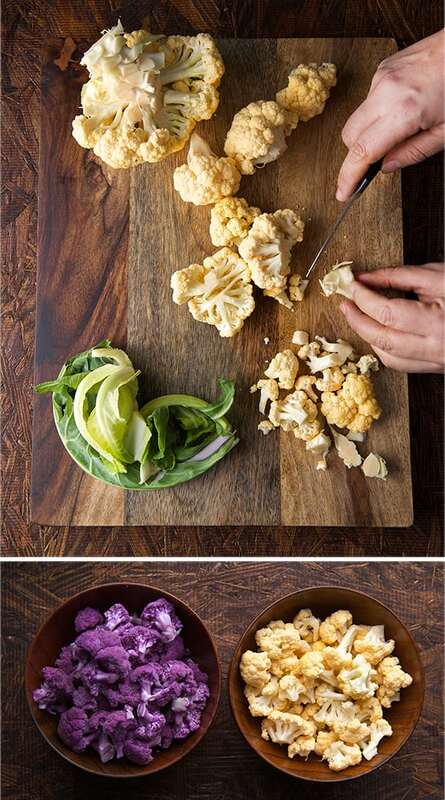 With a small pairing knife cut the cauliflower into small florets. Reserve about 2 cups of the little florets to add to the soup at last. For this soup I used the yellow cauliflower for the soup base and the purple florets to add whole to the soup, it adds eye appeal. 3. Over medium low heat in a medium size pot, add the extra virgin olive oil, and sauté the chopped onions and garlic until translucent, season with salt and pepper. 4. Once the onions are translucent, add ¾ of the cauliflower florets. Toss and add 2 cups of vegetable stock or just enough to cover the florets. Add bay leaf, thyme, fresh sprig of dill or dry, salt and pepper, cover with a lid and let them cook for 7-8 minutes or until very soft and tender. Once cooked, purée them in a food processor, blender, or use an immersion blender until smooth. 5. Place this cauliflower purée back into the pot, add the coconut milk and stir well until blended. Season with celery salt, salt, paprika and black pepper. Add a bit more vegetable stock if the consistency is to thick. 6. Add the reserved mini cauliflower florets, and the pre cooked carrots and sweet potatoes. Cover with a lid and bring to a slow simmer cook for 5 minutes. Taste and adjust the salt and pepper if necessary. Check for doneness on the vegetables; I like my vegetables on the al-dente side, not hard but not mushy. Taste them and decide if you like them softer keep cooking them for another 2-3 minutes. *If using sundry tomatoes add them on step 4 so they can soften before pureeing the chowder. Need some veggies in your life? 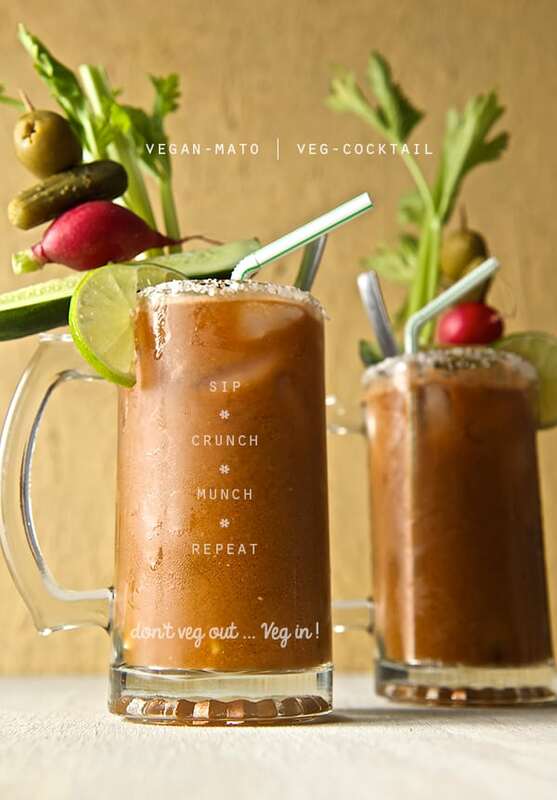 Let’s veg-out!, I mean Veg-in, Vegan-mato is a vegetable cocktail that delivers a fun way to drink and eat your vegetables. 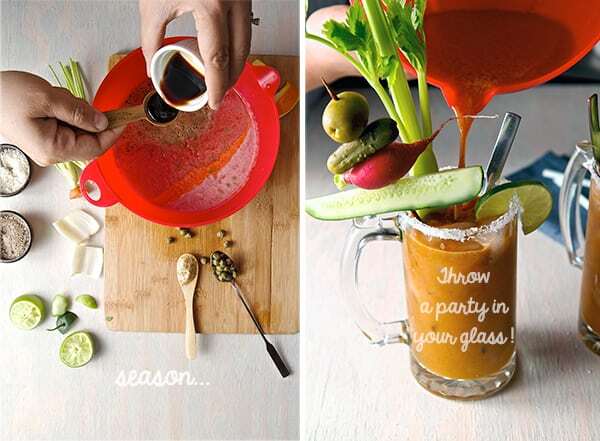 Let’s throw a party in a glass! Sometimes you just need something that boost your inner health and some vegetable motivation in liquid form is the way to go. Not sure what to do with left overs veggies of the week? juice it up! 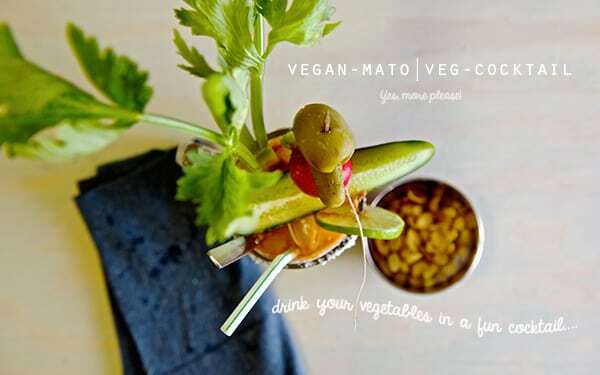 This Vegan-mato is waiting for you, perfect summer power drink, made with fresh vegetables, all natural, extremely flavorful and fun to make. 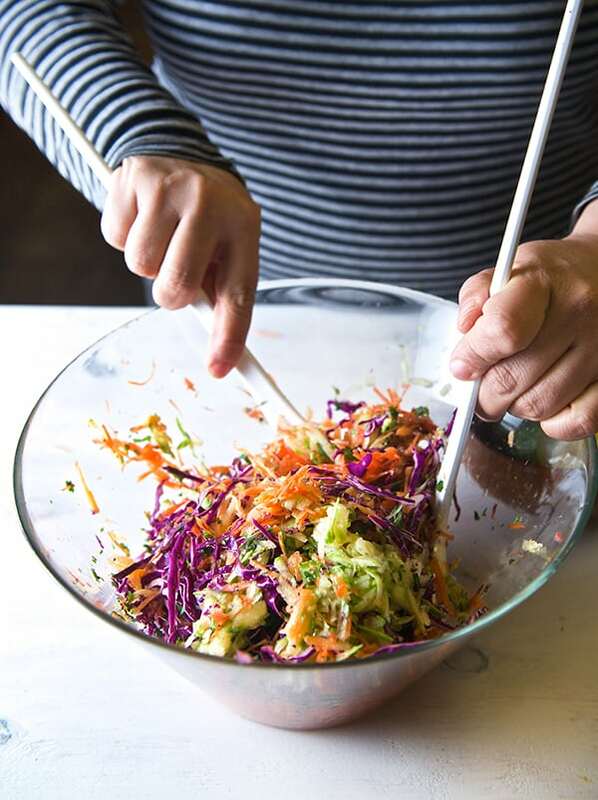 It can’t be easier than to throw all the veggies on a food processor, season, squeeze some lime juice, sea salt, a little hot sauce kick, some ice, a straw and some extra veggies to munch and crunch. 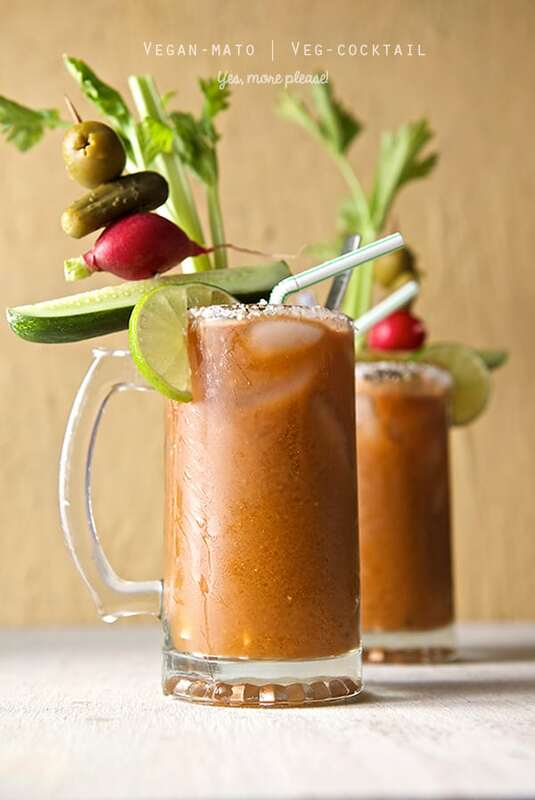 This Vegetable-non alcoholic cocktail is one of the best ways to drink you veggies. Serves 2 large mugs or 4 short glasses. 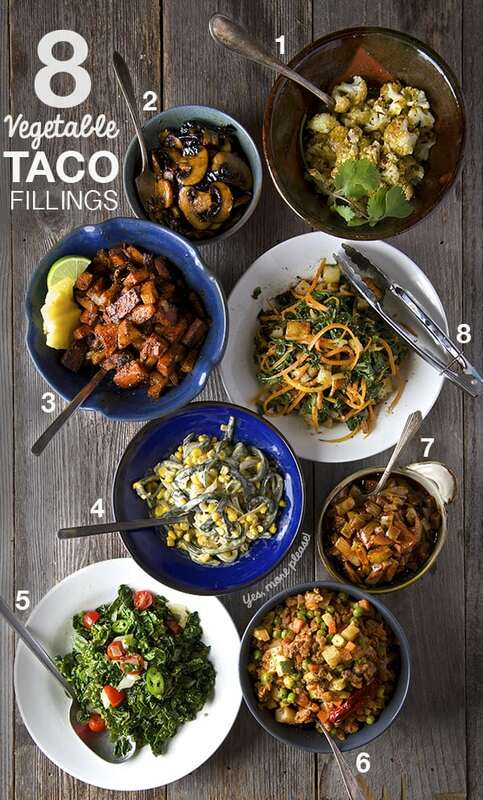 2, 3, 4 dashes of your favorite hot sauce. Martini Olives, jumbo pepper stuffed olives or Jalapeno stuffed olives. Some extra sea salt and a half of lime to cover the rim of the mug. 1. Chill your Mugs, by placing them on the freezer. 2. Wash and cut the hard ends of vegetables. 3. 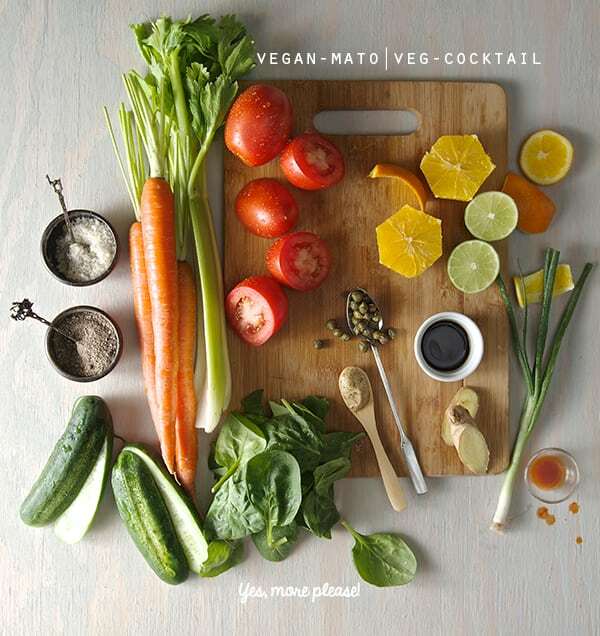 With the help of an electric juicer, juice all your vegetables first and add the orange last. 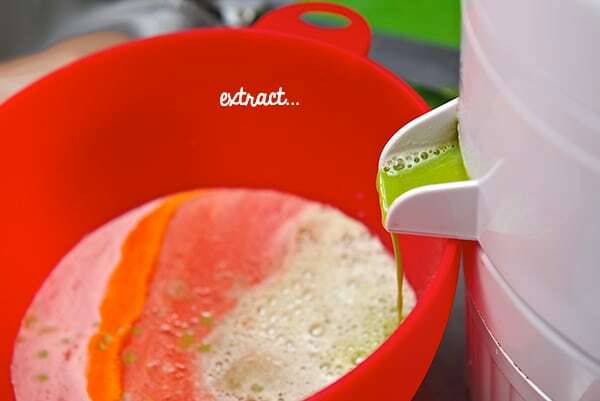 The juicy orange will help to clean up all bits of vegetable flavor on your juicer. 4. To this juice, add the soy sauce, sea salt, pepper, spicy brown mustard, a few dashes of hot sauce, and the juice of two limes. WHISK!!! until well combined. Taste to adjust the flavor. 5. Make your vegetable skewers, using what ever you prefer for garnish, cherry tomatoes, radishes,caper-berries, olives, pickles the limit is your imagination. 6. 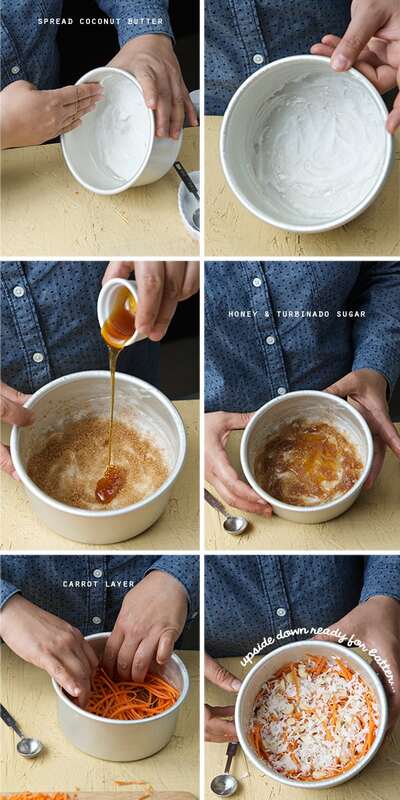 Take the mugs out of the freezer, rub some lemon on the rim and dip it in salt. Add lots of ice. 7. Add your celery stalk, a garnish skewer, a straw, umbrella, sandals, a sunny porch and some great music check our music pairings here! 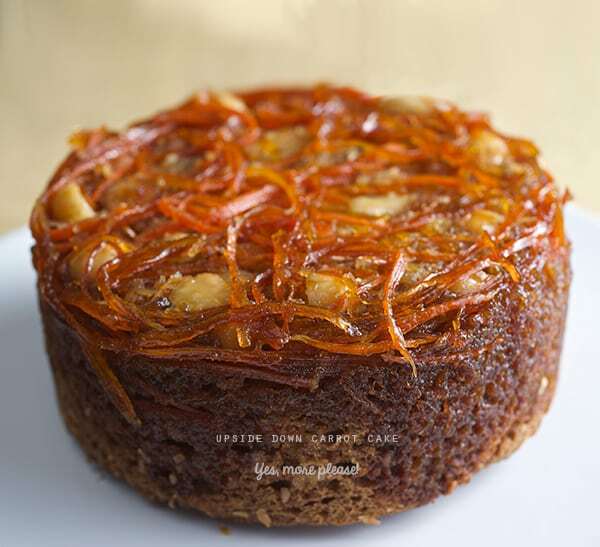 After making the Leek and Potato Tarte tatin, a light bulb turned on in my head and crisscrossed with the idea of a carrot cake. 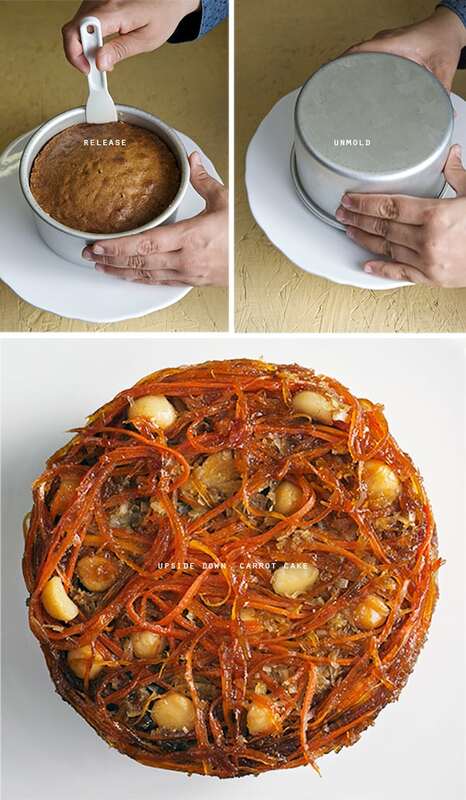 What if I apply almost the same concept of a pineapple cake to the carrot cake? 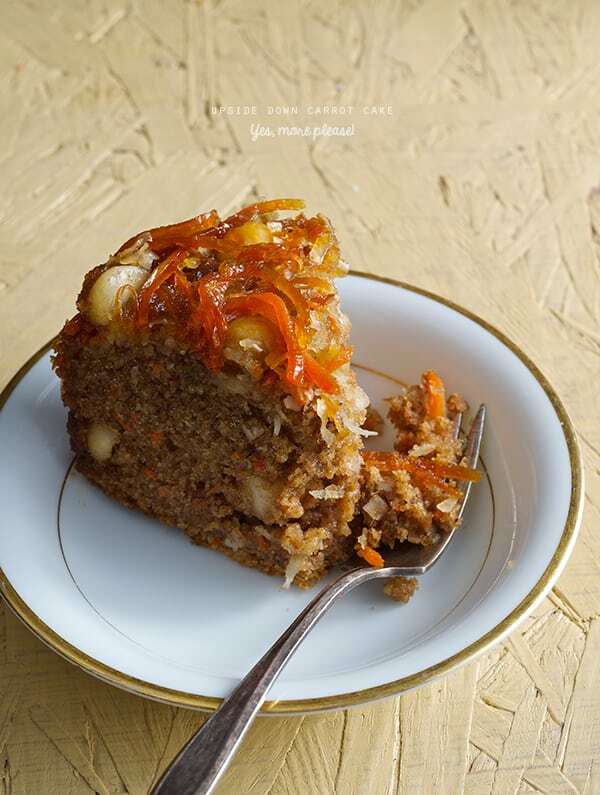 Without hesitation I made ½ of a recipe, and it turned into a delicious unexpected result. 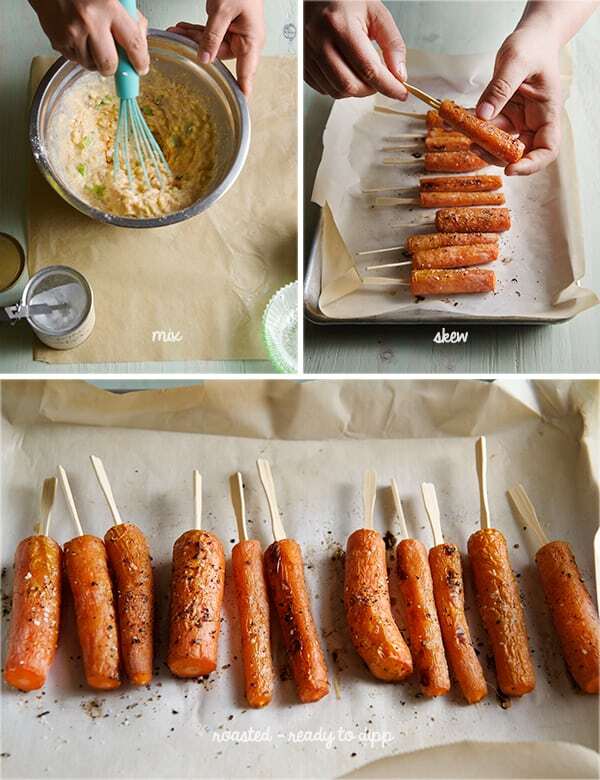 I placed the carrots on the bottom of the pan and used coconut butter instead of regular butter to create a coating. I added some honey and turbinado sugar which caramelized beautifully on the bottom. Adding some freshly ground ginger was the final touch; fragrant with a spicy lemony note. 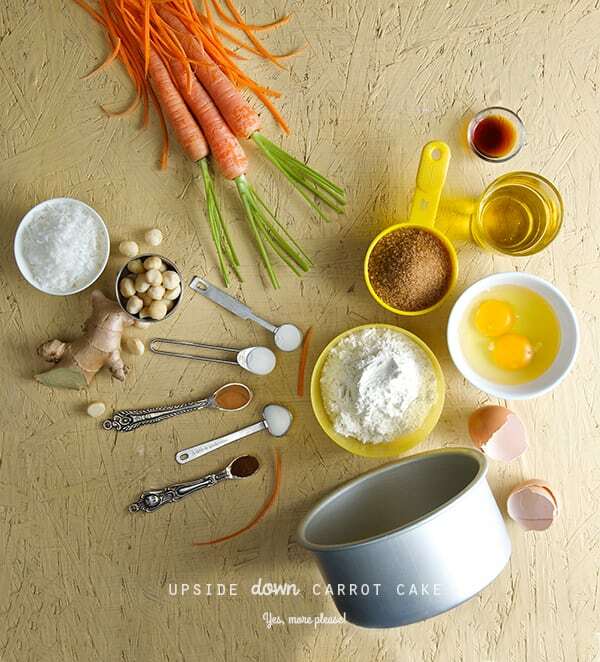 I think Ian looked at me funny when I told him I was baking an upside-down carrot cake. He probably though I was crazy…and then when he saw the cake, he just smiled and understood, and when he tried it he asked: “When are we shooting this?”… So I guess he liked it! This recipe I wrote is for a small 6” cake, since is just Ian and I it is more than plenty. You can easily double it and bake a 9”-10”. for bigger crowds. 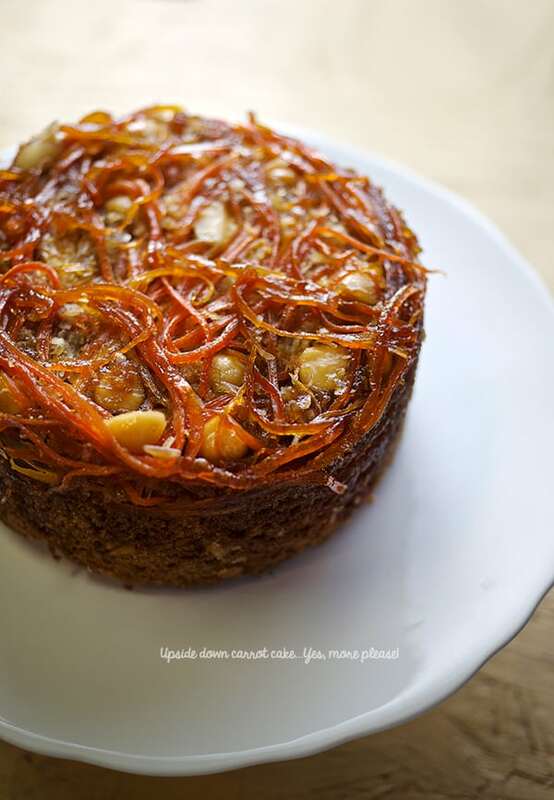 This upside down carrot+coconut+ginger cake will make a fantastic bake good for brunch or a simple delicious birthday. I’m really hopping you enjoy this recipe, shoot us a comment, we’d love to hear from you! ¼ cup roasted macadamia nuts halves or whole. 1. 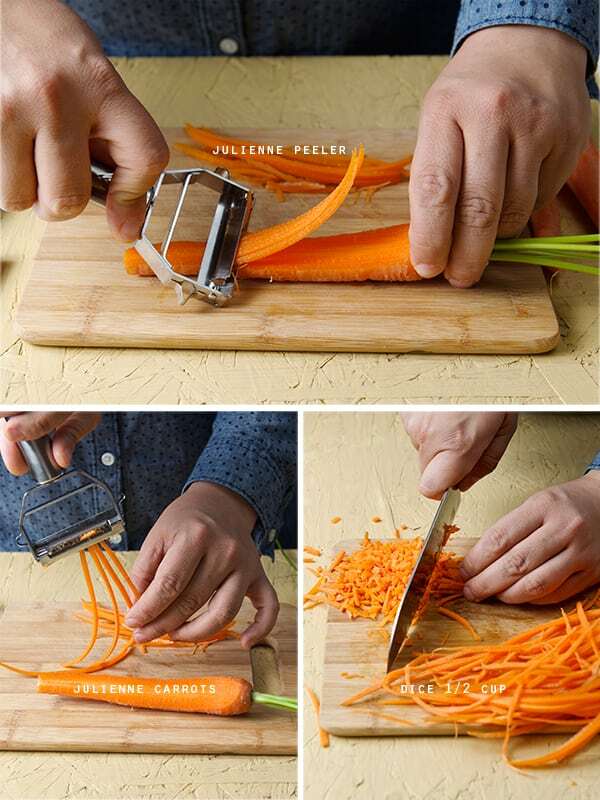 Shred your carrots, This julienne peeler is one of my favorite tools, it is so easy to use, so much fun and time saver. Makes the julienne a dream! 1. In a 6”x 4”tall pan, spread an even thick coat of the solid coconut oil. Thinly grease the sides of the pan as well. 5. 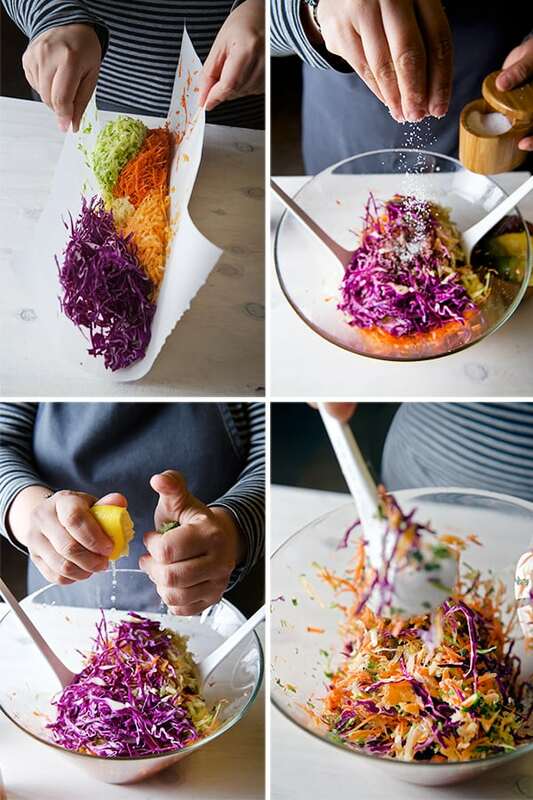 Sprinkle the shredded coconut in an even layer. 7. In a medium size bowl whisk together all the dry ingredients. 8. 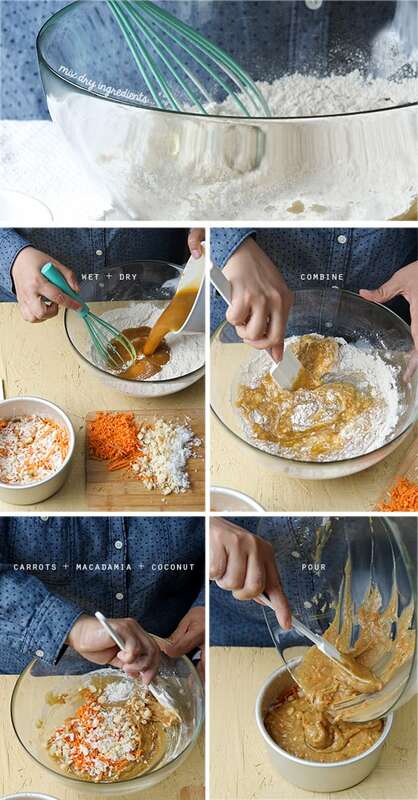 Add the ½ cup shredded carrots, shredded coconut, and roasted macadamia nuts. 9. 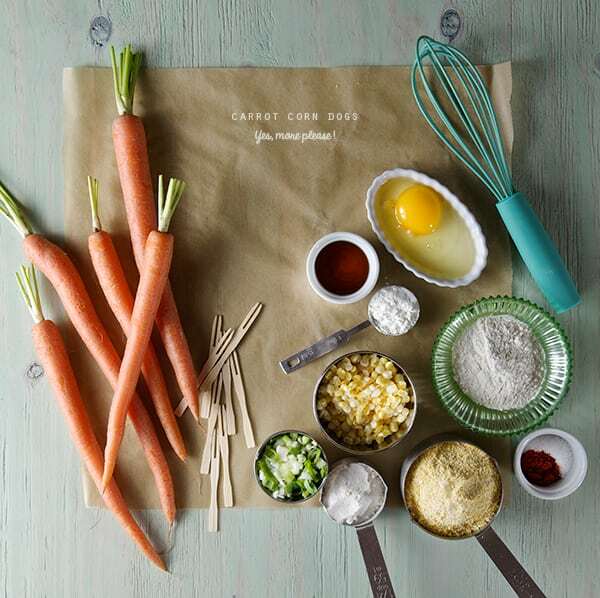 In a small size bowl whisk first oil, sugar and ginger, then add the eggs one at a time and whisk until well combined. 10. 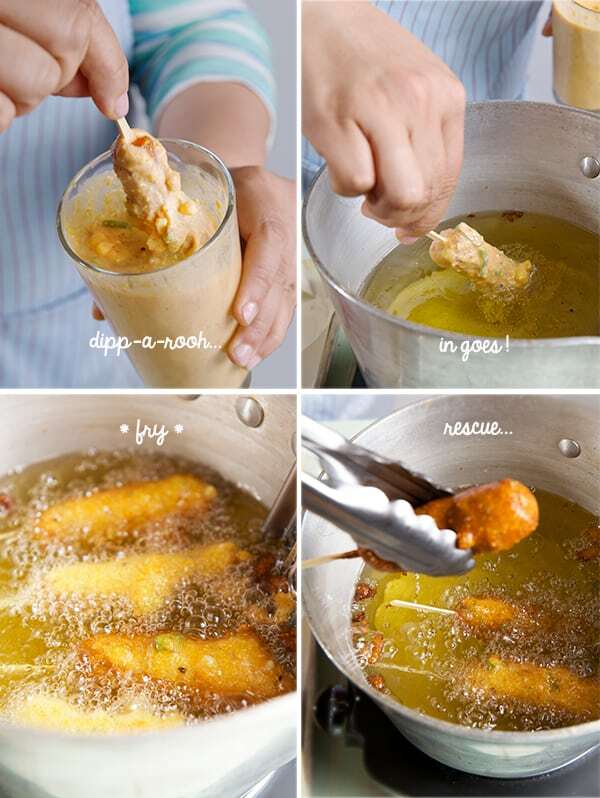 With a spatula, mix wet ingredients into dry ingredients until well combined. 11. Poor the batter on top of the carrot layer, and bake for about 30-35 minutes. Until a toothpick in the center comes up clean. 12. Cool on a rack for 20 minutes and un-mold the cake before its completely cool. Knife… Ready, set go!… first slice is mine!…Enjoy! 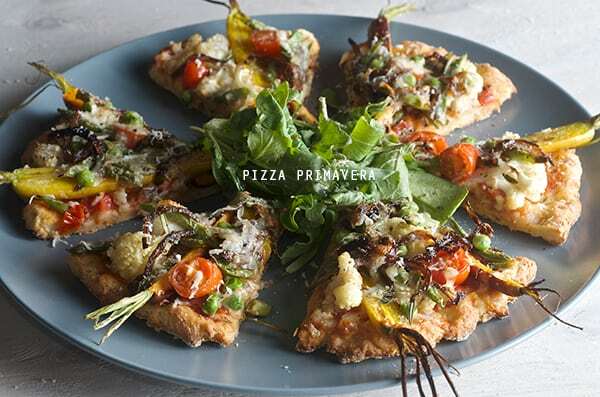 Pizza Primavera is a celebration of Spring! 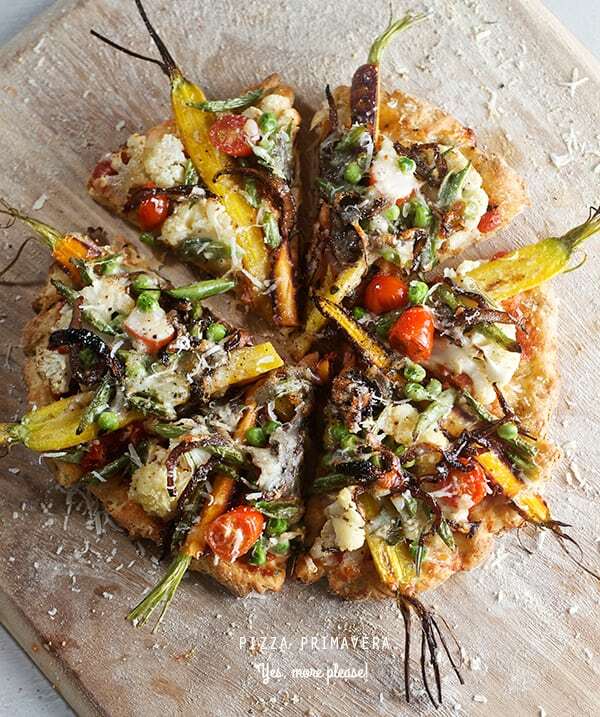 Using all the tender, sweet, crisp and fresh vegetables that the season gives us and inspired by all those beautiful shapes, colors, and textures this pizza has a refreshing taste of renewal. 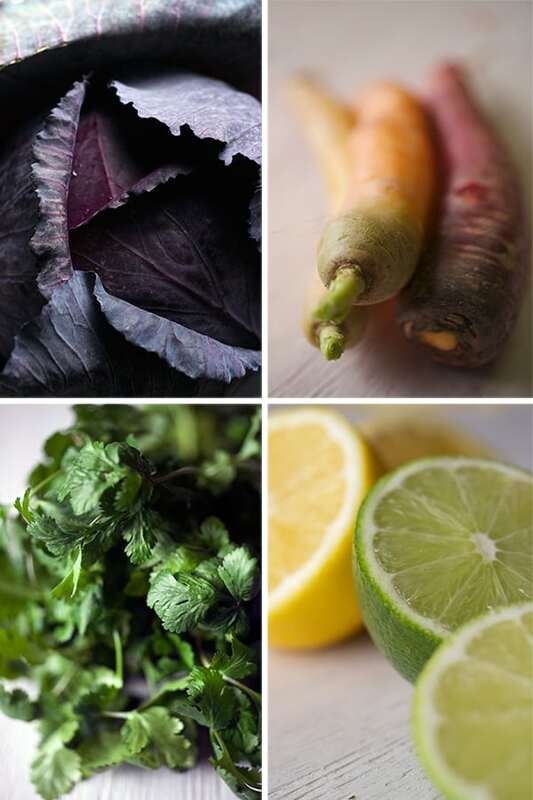 For me renewal translates as experimenting and trying ingredients and flavors that come with the new season. Recently I’ve been experimenting with different gluten free flours, like oatmeal, brown rice, potato starch, tapioca, garbanzo, and quinoa. The fact that lately a lot of people have been diagnosed with a gluten intolerant condition means more are in need of extending their cooking horizons. Even if you don’t have gluten intolerance you should try this for its variation in flavor and texture. Recently I baked an Irish Soda bread using 1/2-1/2 whole wheat and oat meal flour, which gave to the bread so much flavor than regular all purpose flour. That got me excited and I started to experiment with the not so easy task to come up with a gluten free pizza dough. For this pizza crust I experimented with different ratios, of brown rice flour, tapioca, potato and millet flour. The results were delicious and flavorful. However it ended up a bit overpriced for what a pizza dough should cost. I used 3-4 different types of flours each one had a mission to give the right texture to the crust, great achivement, but not very practical. So in my quest for a more reasonable option I stumbled upon a great mix, Bob Red Mill Gluten Free Organic Pizza Dough. I read the ingredients and to my surprise this mix is based on almost the same combination of 4 different flours I was trying to combine. The difference: I bought one bag. This simplifies the whole process for a fraction of the cost, and in my case pantry space. (I have a tiny pantry). Next, I gave myself the task to make this crust using this mix… and it was great!. Flavor and texture were spot on. When trying new things you have to see with new eyes, and tastebuds. The texture of a regular crust has a certain chewiness for which gluten is the responsible. When you have no gluten, other textures and flavor come to replace that chew factor. This crust has a lovely light texture, great flavor, and crunch, with a tender bite, making it easy to love. The tender light crusty and crunchy crust is the perfect canvas for the sweet delicate Spring vegetables. The mix is ready in 5 minutes and it does not requires kneading. Proofing time is 20 minutes and it bakes in 12 minutes total. It’s fun to make and I loved trying something new. This crust is a keeper! 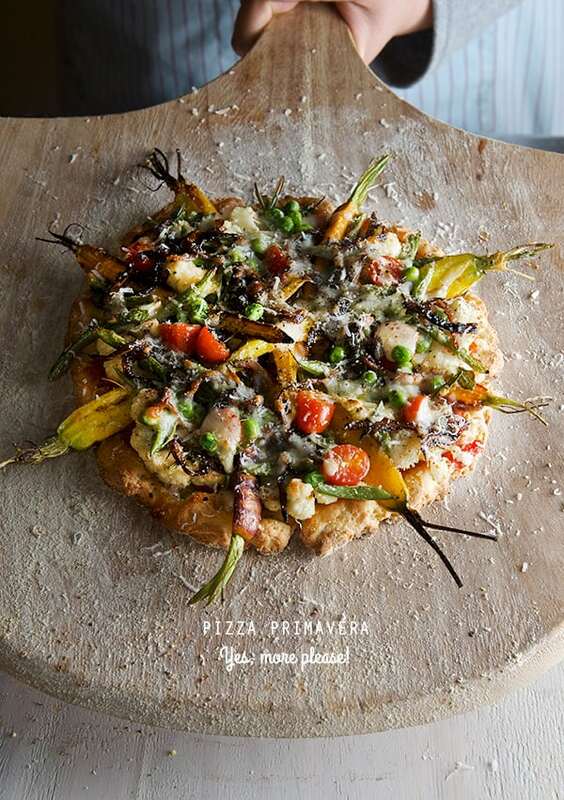 For this Pizza Primavera, pre-roasting the vegetables is a must. They add extra flavor deep to the pizza. I love to leave the carrots al-dente, they add a bit extra crunch and texture to the pizza. Cheese?…my advice: go light on the cheese you want to be able to taste the vegetables. I chose a smoked provolone to balance the sweetness on the roasted vegetables. You must try this pizza, I assure you, you will fall in love with it. Give your self the chance to explore and renew your taste buds, perhaps for your next dinner party or get together… and have fun welcoming Spring! 12-16 small spring carrots cut in half. 2-3 bunches thin sweet green beans cut on a bias. 2 cups Sliced Cauliflower florets. a pinch of salt and fresh cracked pepper. 2 cups roasted crushed tomato sauce. 2-4 sprigs of fresh herbs, like oregano, rosemary or basil. 3 cups grated smoked provolone cheese or tofu for a vegan option. 2 eggs or 2 tablespoons of flaxseeds and 8 tablespoons of water for vegan option. 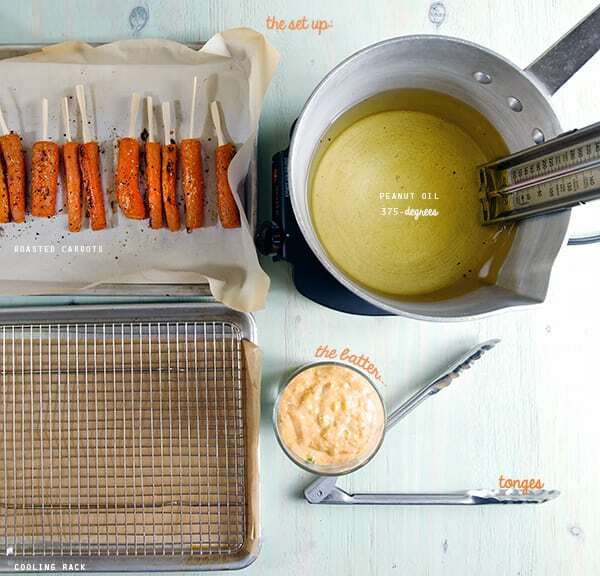 You can use a cookie sheet or a metal round pizza tray that will work too. I recommend, if you are a pizza lover, a pizza stone or the Saltillo tile, are a great investment. The crust gets a fantastic color, and it gets crunchier when is cooked onto a stone surface. *How or where to get a Saltillo tile? At your local home improvement store. You must make sure its and unglazed quarry tile.Usually the name is Saltillo tile, from the region in Mexico. They come in two sizes, I prefer the 11×11. Usually you can fit 4 into your oven, if you are planing to make a big pizza, For us 1 or 2 tiles are enough. A smaller size pizza like an 8” will cook great and evenly onto an 11x 11. The magic of these tiles is that you can use them in the oven and over the grill, if you feel like you want a grilled pizza, this works like a charm, price-wise we paid around 1-3 dollars per tile. This is a good solution if you don’t happen to have a pizza stone. And regarding durability: we’ve been using the same tile for six years! To prepare the tiles for baking: Presoak them in water the day before, and let them air dry. Once they are totally dry they are ready to use. Be careful not to heat them wet to avoid cracking and of course let them cool before removing them from the oven or cleaning them. 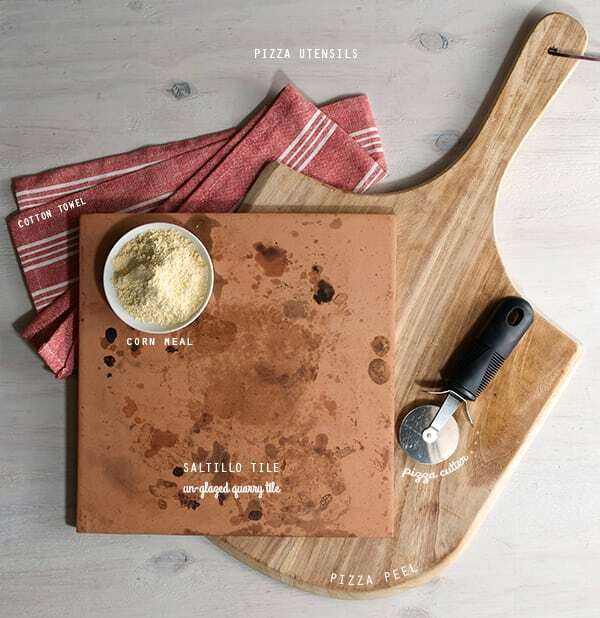 Place your pizza stone or Saltillo tile into the oven to start warming up. 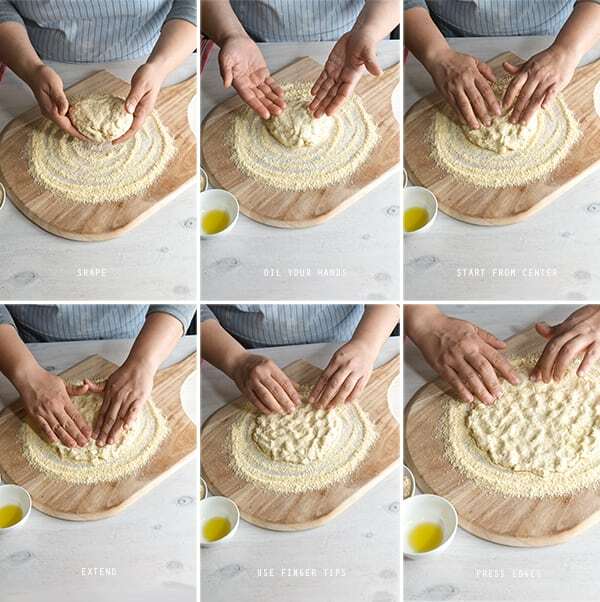 Start by making your pizza dough. Follow the instructions on the package, I did not use the mixer, I used a wood spatula and kneaded by hand for a bout 2 minutes. Divide the dough in 4 equal parts, pre shape into 4 balls, cover with plastic wrap and let it proof at rom temperature for about 20 minutes. In a sheet pan, lined with some parchment paper, place the carrots, cauliflower and green beans, drizzle with a bit of olive oil salt pepper and roast at 450 F for about 5-7 minutes. 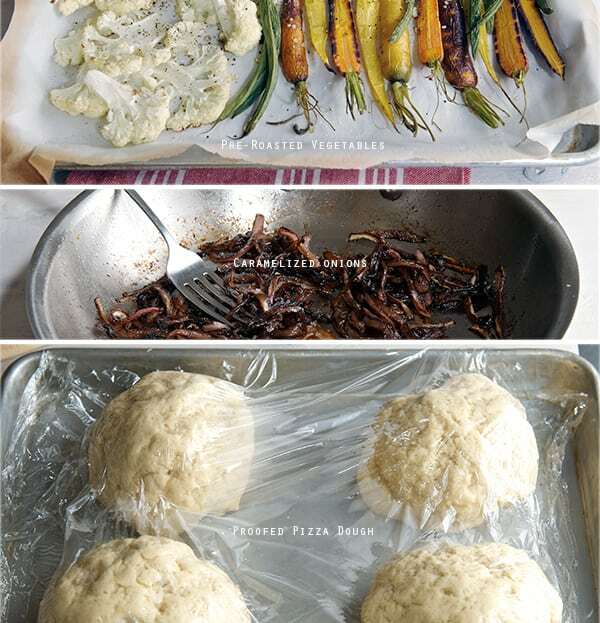 The vegetables should look not completely roasted, as they will continuously cook when placed on the pizza. 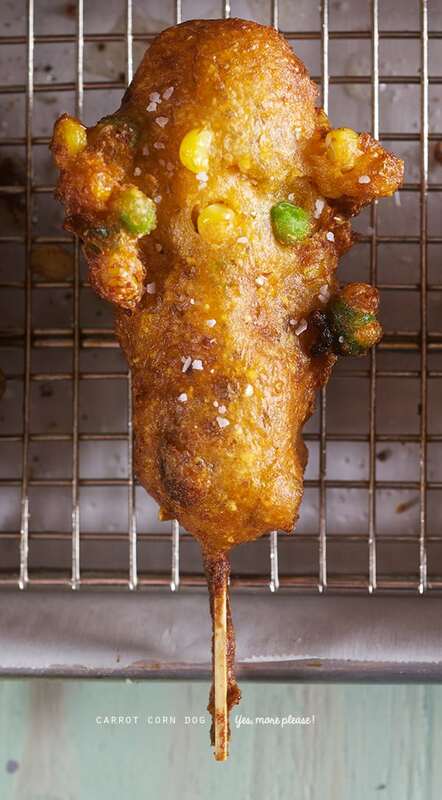 You want the vegetables, tender with a bite. 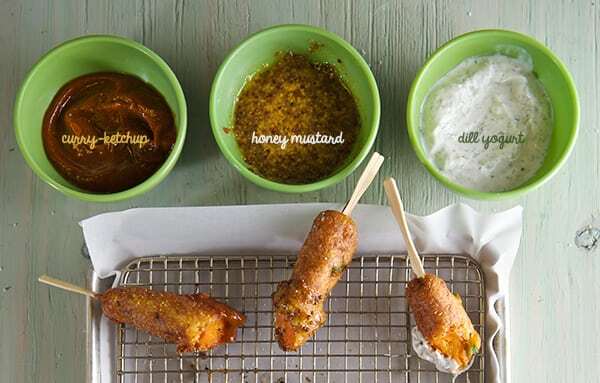 Mix all your sauce ingredients, adjust salt and pepper, and warm for a few minutes to marry the flavors. 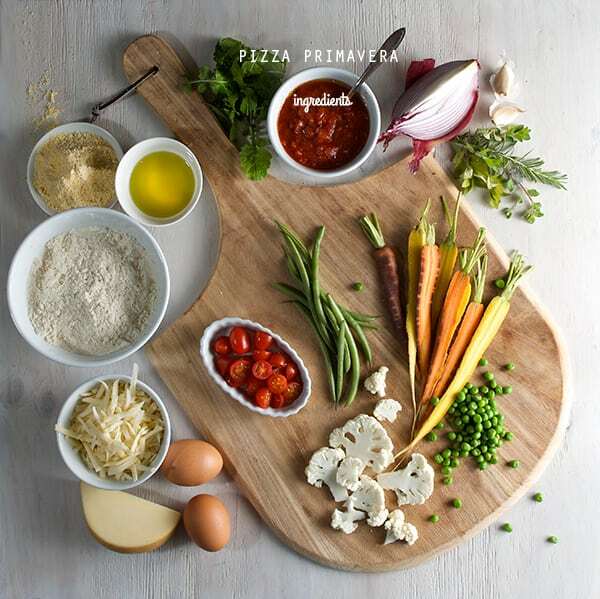 Cut your tomatoes, grate the cheese, season your sauce, pre-roasted vegetables, have everything ready to have fun topping your pizza! Crank up the oven temperature to 500F. This gets the crust crunchy when it cooks on the hot pizza stone. Once you have the 8-9”round pizza dough, make sure its lose, by gently shaking the pizza peel in horizontal motion. 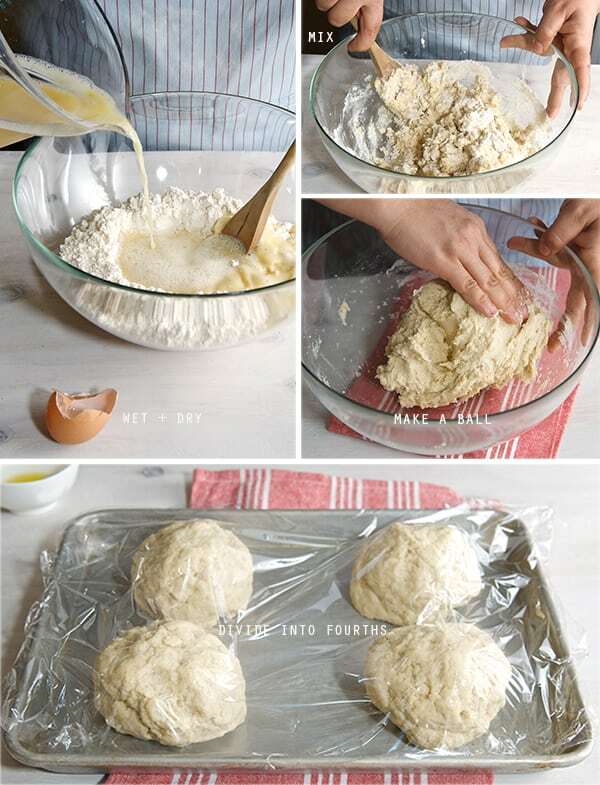 The dough should scoot around easily. Place the pizza peel onto the pizza stone. 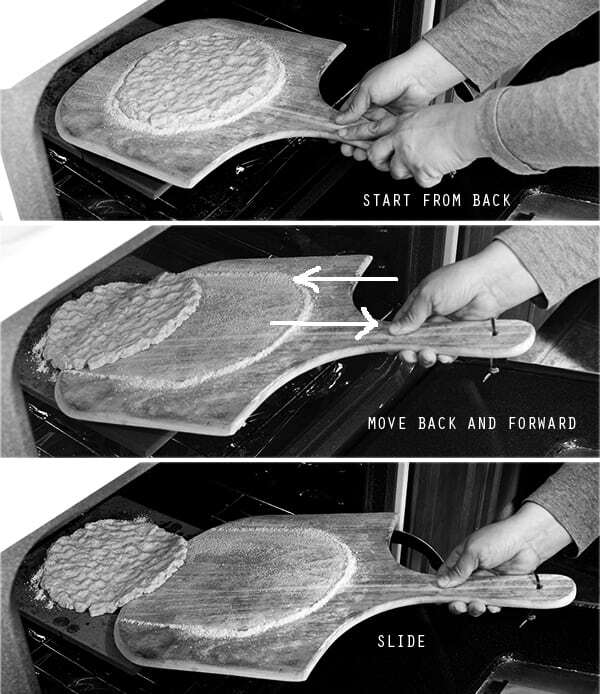 Gently shake the wood peel back an gently forward to slide the pizza crust onto the pizza stone. See picture below. Be as quick as you can so the oven does not loose temperature. Immediately close oven door. And adjust oven temperature to 450.Bake crust for 5-7 minutes until slightly golden brown. With the help of the pizza peel remove the crust from the oven and proceed to place the toppings. Start with a thin layer of tomato sauce, and place the roasted carrots and veggies along the radius of the pizza crust. Add the caramelized onions, top with grated cheese, and sprinkle fresh herbs. Place the pizza back into the oven for another 7-8 minutes, or until the cheese is melted and it has some color. 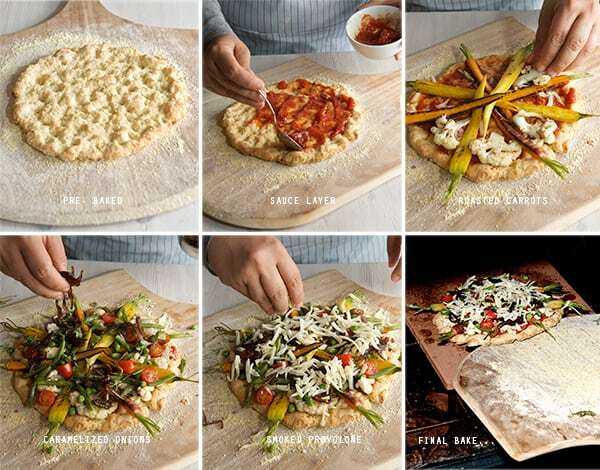 With the help of the peel pull out the pizza into a wood board. Let it rest for 1-2 minutes, and proceed to cut. You can use a pizza cutter or a chef’s knife. Is it Spring time yet?… I think we are almost there. 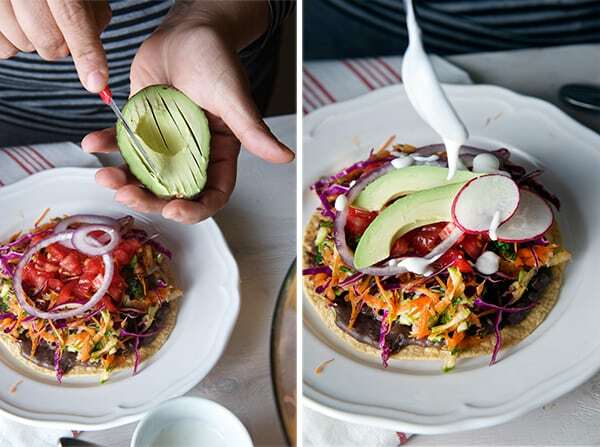 This Raw Veggie Tostadas scream welcome spring!, Spring is about renewal, everything in nature starts again, a new cycle that makes me feel like eating fresh,crunchy root vegetables. There is an abundance of them right now, lots of cabbage, carrots, radishes at the farmers market. For me is time to set aside the roasting pans, lets eat them raw. Raw vegetables have an earthy and unique flavor, they are juicy and sweet. I’ve learned to loved them when I shred them, it is so easy to eat them raw and when you combine them in a salad they are also so attractive to the eye and all together make a crunchy symphony texture, simply amazing. This recipe screams “easy”, you can whip this up for a week dinner or an easy-laid back weekend lunch. This recipe its one of my favorites, Ian and I used to have them almost once a week for our veggie night or our MM, Meat-less Monday. Have fun and enjoy! 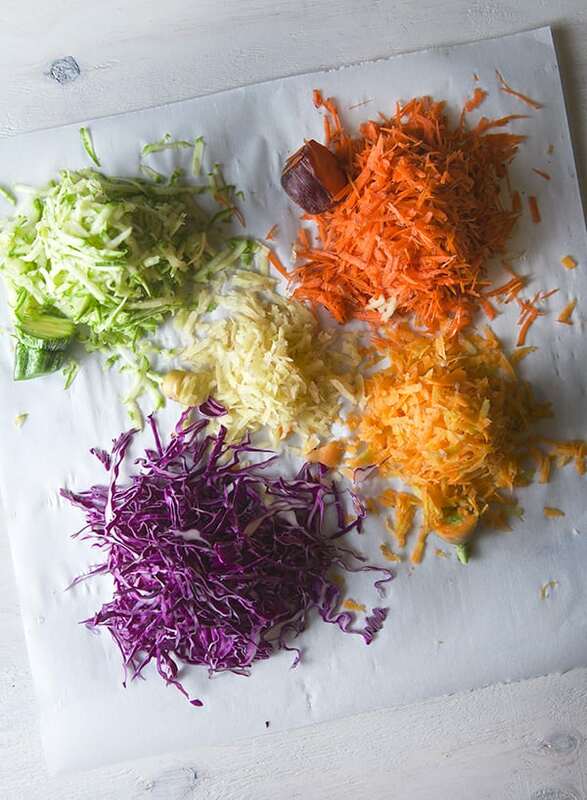 4 shredded carrots…any color any variety. 3 tablespoons of greek plain yogurt + 1-2 tablespoon of milk + pinch of salt. 2 Tablespoons queso fresco or feta cheese crumbled or small diced firm tofu. 2-3 medium size tomatoes roasted and peeled. 6-8 toasted chiles de arbol. 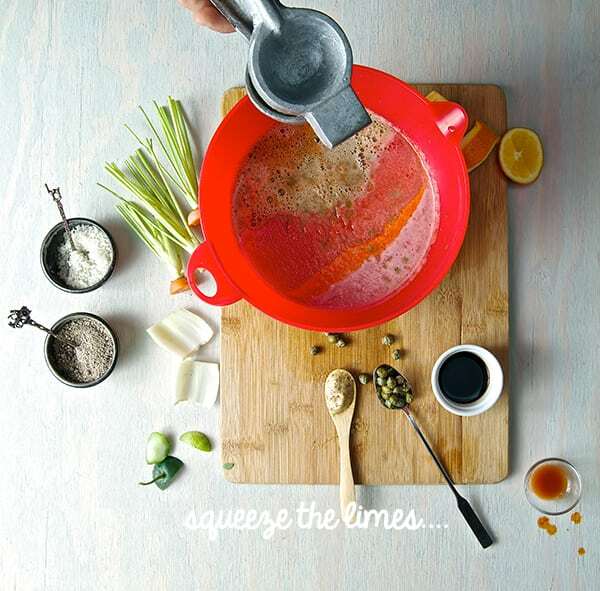 Place all the ingredients in the food processor, until well blended, add a little warm water if needed for consistency. The salsa should reassemble a lose puree. 1. Warm up the beans, you can use refried beans if you like. 2. 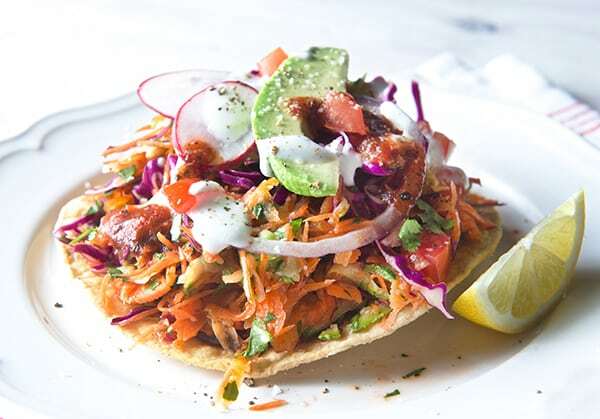 In a large bowl, combine carrots, zucchini, cabbage, cilantro, the juice of lime, lemon, salt and pepper to taste, toss well. 3. Make your Salsa…I made this Salsa Roja Asada click for recipe here. 5. 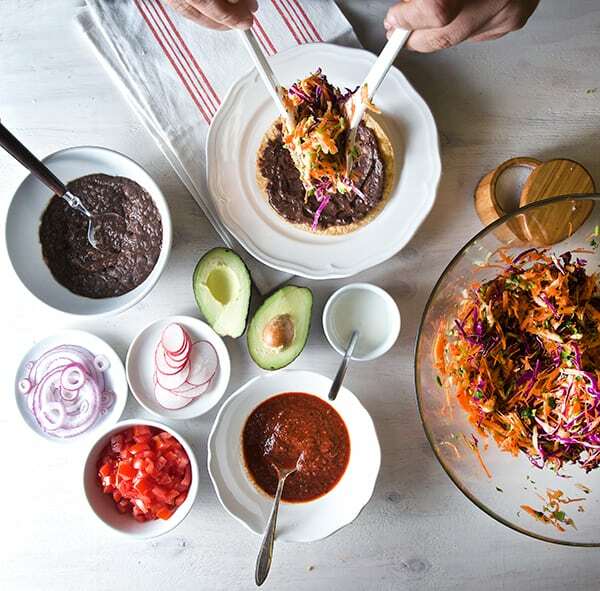 Assemble the tostadas, spread a light coat of beans on the tostada (this will be your glue!) and then a generous amount of the vegetable concoction. Top with slices of onion, avocado, drizzle some of the yogurt sauce, and some salsa. Serve immediately. Enjoy! Have you had your rainbow today? January brings the roots out. Its a fun time at the farmers market a great variety of root vegetables. What caught my attention this time were the carrots. Great variety of colors, from red, orange, yellow and pale cream color. How can you not get inspired from all this colors? So I bought a bunch of the red carrots including the greens. 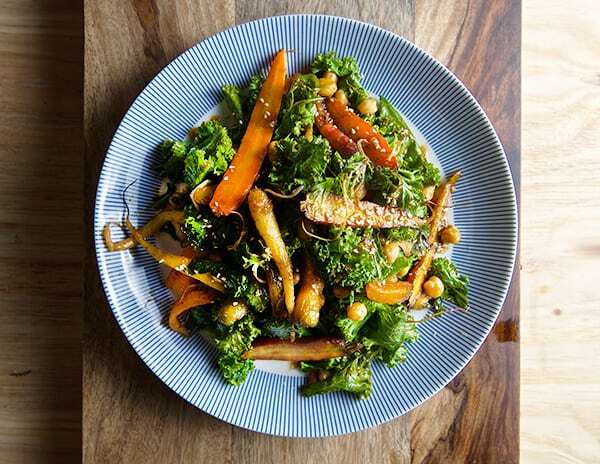 Carrot greens are really tasty and a great source of vitamin C, potassium, calcium and vitamin K and are also high in protein. Flavor-wise they taste a bit peppery and resemble parsley. They are also a great addition to any salad and you can make pesto or tabbouleh with them… in fact!… that might be the next recipe I will attempt. 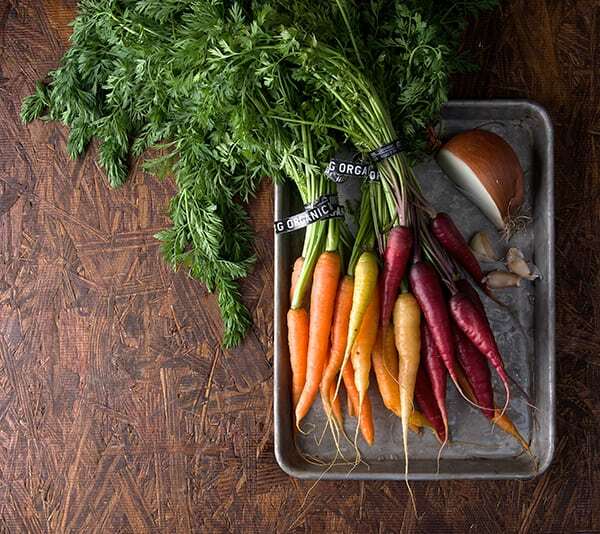 When you are buying carrots and carrot greens, make sure your source is organic. 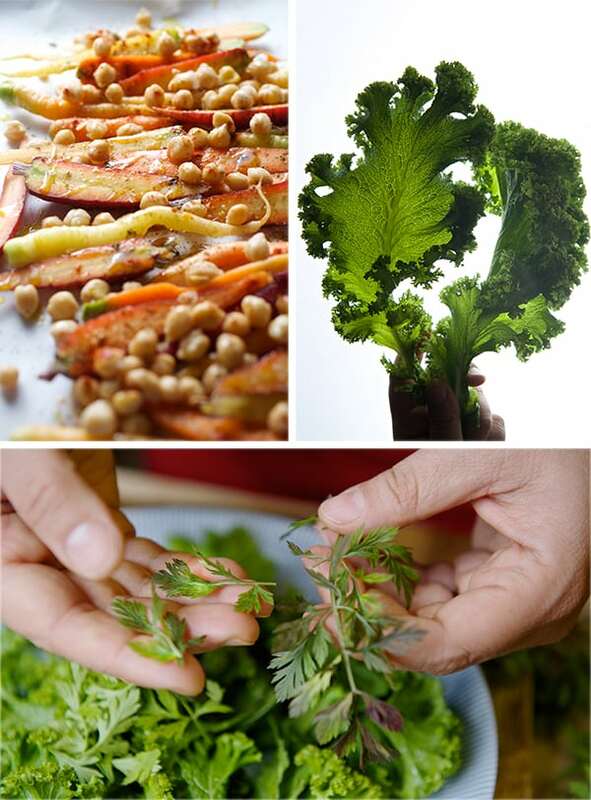 There is a bit of controversy about eating the tops or the carrot skins and other non-organic vegetables. 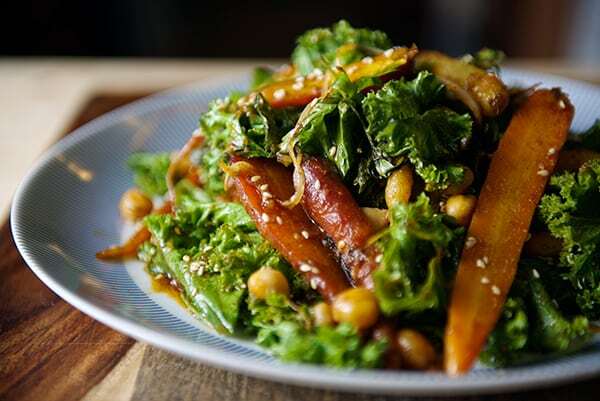 Know your source and enjoy your carrot greens with no worries. 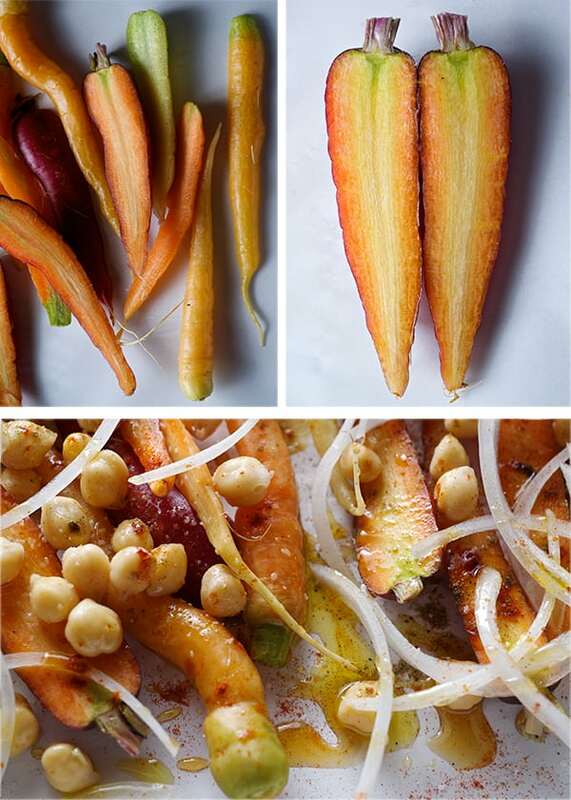 For me, roasting is one of the best ways to bring out the sweet flavor of the carrots. 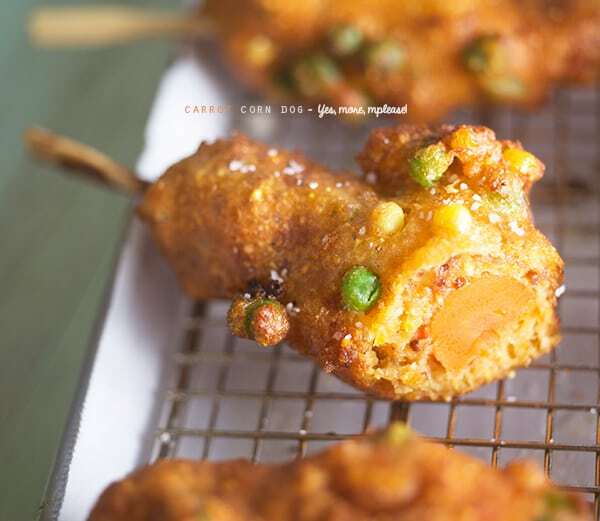 The skin gets caramelized while inside it remains tender and all the ‘carrotness’ flavor is contained in a little cute pencil shape. Delicious! For the vinaigrette I took the same spices you will use to make hummus and I mix them with some sesame oil, extra virgin olive oil, and lemon juice. 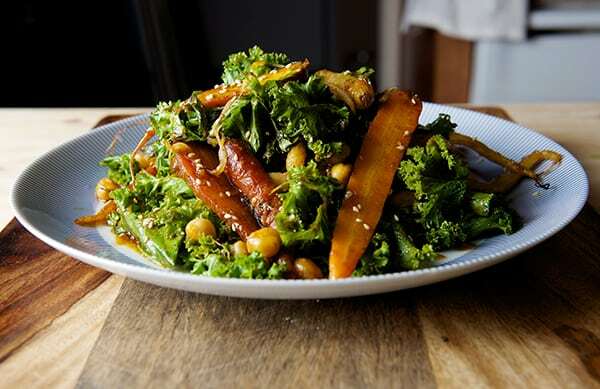 This Roasted Carrot Salad with Hummus Vinaigrette Its easy to make, and very comforting. Enjoy! Serves 2 as main course, 4 as side dish or 1 wabbit feast. 2 bunches of carrots red, orange yellow any kind will work. ½ cup carrot tops washed and leafs cut. 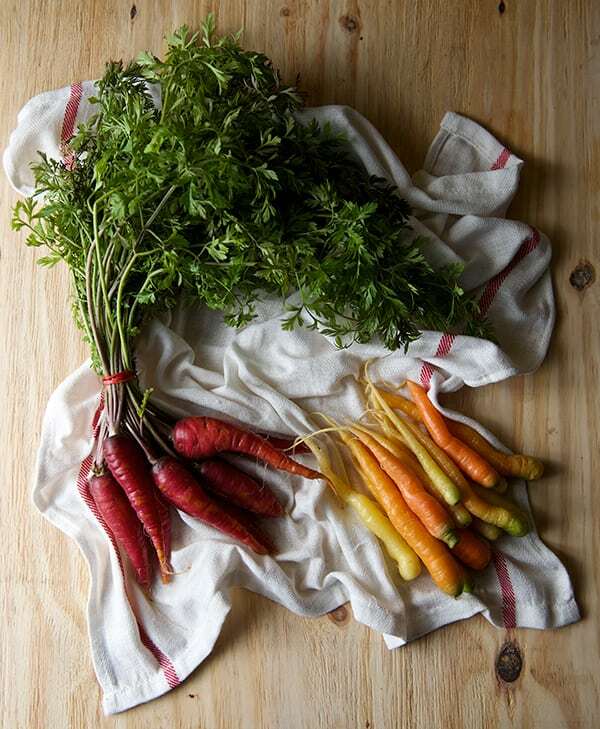 Wash and pad dry your carrots upon size, slice carrots in half or quarters for evenly roast. 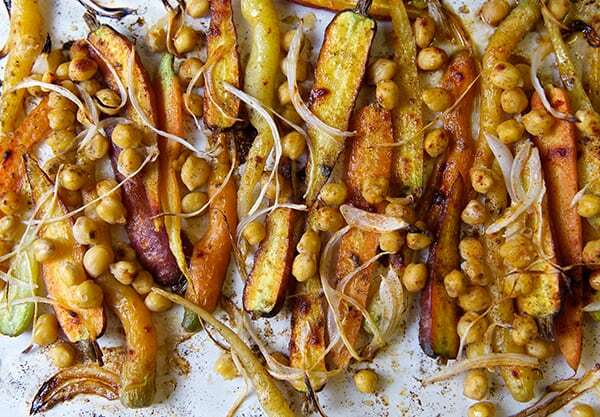 In a baking sheet lined with parchment paper place the carrots, onions, garbanzos, drizzle a bit of olive oil and sea salt. Roast them for about 10-15 minutes or until caramelized and fork tender. Mean time prepare your vinaigrette by simply combining all the vinaigrette ingredients in a small bowl whisk until well combined. Set aside. Check on your carrots. If they look done they will show golden tones and edges a bit charred and fork tender. Remove them from the oven and in the same tray toss the mustard greens and half of the vinaigrette, toss and place back in the oven for about 1-2 minutes which will slightly warm up the mustard greens. 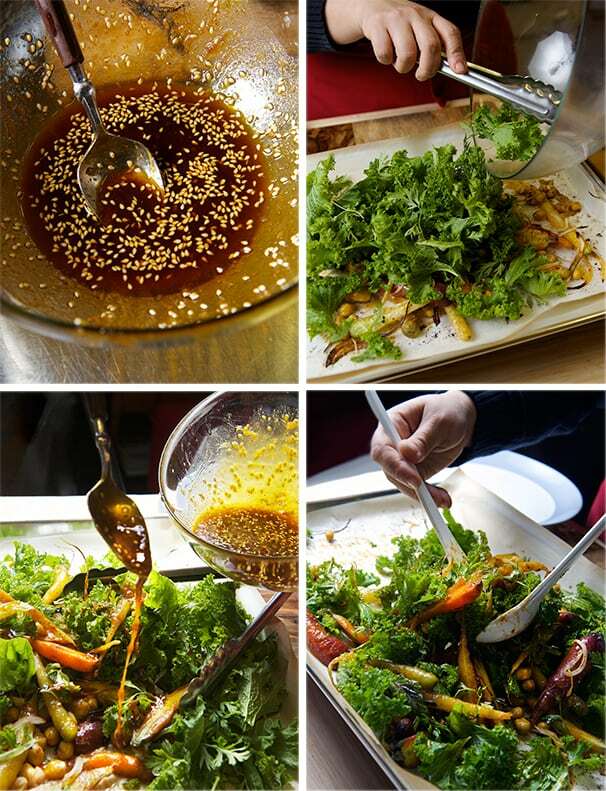 Serve immediately and drizzle the rest of the dressing, adjust salt and pepper, squeeze more lemon, sprinkle a few more toasted sesame seeds if desired. Serve with toasted pita bread and a dollop of yogurt on the side. Enjoy!